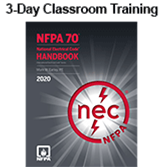 Throughout the United States and around the world, NFPA 70®, National Electrical Code® (NEC®), sets the foundation for electrical safety in residential, commercial, and industrial occupancies. The 2017 edition of this trusted Code presents the latest comprehensive regulations for electrical wiring, overcurrent protection, grounding, and installation of equipment. Get up to Code with the latest changes in the 2017 NEC ® with this online training series. 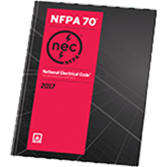 NFPA 70®, National Electrical Code® (NEC®) sets the foundation for electrical safety in residential, commercial, and industrial occupancies. Learn more about adoption efforts, adoption status, and the support of the Electrical Code Coalition, which works to increase focus and emphasis on electrical safety for persons and property through direct and full adoption, application and uniform enforcement of the latest edition of the NEC®. 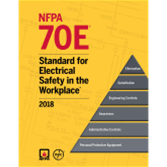 NFPA's family of codes and standards that deal with electrical issues - including NFPA 70®, National Electrical Code® (NEC®), NFPA 70B, Recommended Practice for Electrical Equipment Maintenance, and NFPA 70E, Standard for Electrical Safety in the Workplace, reflect changing industry needs and evolving technologies, supported by research and development, and practical experience. 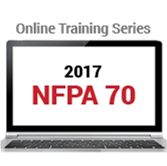 NFPA 70E® formats include PDF, eBook, Hardbound, and Softbound. Improve your ability to use and apply today's NEC® requirements in your work environment with applied learning taught by the nation's leading electrical code experts. Interact with NFPA's renowned electrical instructors in a collaborative learning environment, with topic-driven lessons tailored to real-world situations. Then solidify your Code knowledge through engaging discussion, revised activities, and practical exercises based on key concepts in NEC. You'll leave with vital takeaways that will help you comply, increase confidence in your ability to recognize potential problems, and avoid costly rework or safety violations. Improve your ability to use and apply today's NEC® in your work environment. 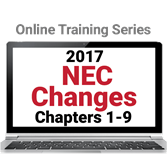 Get NEC® training on demand with the 2017 edition NEC Online Training Series! Today’s employers are increasingly demanding evidence of competency from employees and contractors. Certifications are an essential tool for demonstrating that competency, as well as helping professionals stand out in the crowded job market.  NFPA offers a family of certifications in support of NFPA electrical standards such as NFPA 70E, Standard for Electrical Safety in the Workplace; NFPA 110, Standard for Emergency and Standby Power Systems; and NFPA 111, Standard on Stored Electrical Energy Emergency and Standby Power Systems. Whether you are an electrician, an electrical safety program manager, a facility manager, or anyone else who needs to know about electrical safety or emergency and standby power systems, NFPA certifications can help you prove your knowledge, proficiency, and professionalism. Keep up with the fast-paced world of electrical safety issues with news from NFPA: our blog feed, our monthly newsletter, research reports, and by joining our NFPA Electrical Member Section. 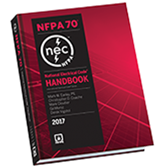 NFPA's NEC Handbook provides in-depth support for safe, compliant electrical design and installation.